The party’s over for fish oil. It had a long run, but it was just a stepping stone to something much, much better. Don’t get me wrong — omega-3s are still absolutely critical for your healthy future. But getting them from fish oil? Today’s toxic world is one of the biggest threats to your health going. So it kills me when the most popular nutritional supplement of all1 is processed from tainted raw sources! There’s no doubt the fish used in fish oil — sardines, tuna, anchovy, mackerel, salmon — can be laced with heavy metals like mercury, cadmium, and lead and chemical toxins like dioxin, PCBs, PCPs. And no distillation process is 100% perfect. Trace amounts remain. One study found PCB trace levels varied widely from one fish-oil product to the next.2 Even tiny levels are a concern because PCBs and heavy metals accumulate in your body. In a supplement you’ll take daily for years on end — no thanks! Fish oil can turn into the wrong kind of powerful. You see, fish oil begins oxidizing practically the minute processing begins. By the time you take it, much of the fragile omega-3 could be destroyed. Besides the stinky smell you burp up, you end up consuming rancid fats. That’s not good! Oxidation creates harmful free radicals that damage cells. Rather than reduce your health risks, oxidized fish oil may actually increase them. Omega Rejuvenol offers you a superior alternative with its exceptionally pure Antarctic krill and Argentinian squid. And its payload of antioxidants like astaxanthin and vitamin E prevent oxidation from taking place. You get the omega-3 benefits you want without the worry. Just sit back and enjoy the results! 2. Millstone K. “Lawsuit: Disclose PCB Levels in Fish Oil.” CBS News. March 2010. I’ve seen hundreds of fish oil formulas over the years. And every single one shortchanges you on the most beneficial omega-3 of all. I never stopped looking for better sources of this “Super Omega,” even while the billion-dollar fish oil industry kept banging its own drum. I wanted my patients to get the bigger, better, and faster results they were promised with fish oil — and were still waiting for! 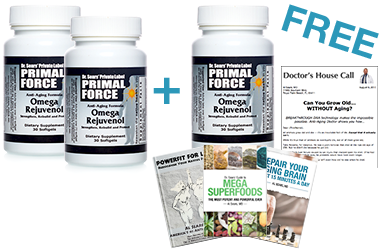 That’s how I uncovered not one but two ideal sources for the “Super Omega” your body is mostly begging for — and you won’t believe the difference they can make. How Fast Do You Want to Feel Younger? 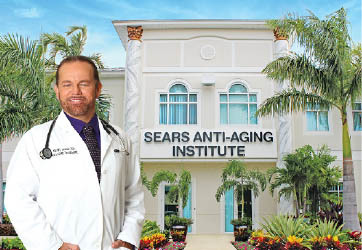 I was one of the first doctors in America to be board-certified in Anti-Aging Medicine. Since then, I’ve treated more than 25,000 patients using the best natural and nutritional solutions known to science. 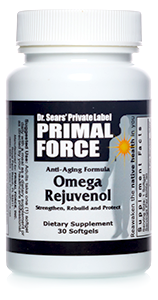 After decades of practice, I’m convinced this “Super Omega” is nature’s most powerful single medicine of all. Problem is, it’s all but missing in the typical modern diet. And fish oil doesn’t fill the gap. The “Super Omega” is called DHA (docosahexaenoic acid). For decades, it was lumped together in studies with EPA (eicosapentaenoic acid) — the dominant omega-3 in fish oil. But when scientists began isolating DHA in clinical studies, they quickly realized they had something special on their hands. They were amazed! In fact, when I started taking a higher dose of DHA myself, the soreness I usually have from an old Achilles injury disappeared in a few short days. And I’m not the only one in the aches-and-pains department who’s smiling. Whether you’re approaching 50 or rounding 70, DHA tackles practically every anti-aging goal on your checklist. That’s why the debate isn’t whether to get your omega-3s from plant sources, fish oil, or fish itself. That’s last-century thinking. Where On Earth Can You Get the Most — and Best — DHA? So I went on a search for the world’s best DHA sources, and it took me practically to the ends of the earth to find them. If you want to follow my footsteps, you’d better pack warm… because the first great DHA source is found off the coast of Antarctica. 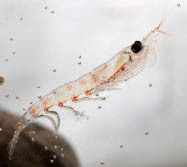 It’s called krill, and it’s a tiny shrimp-like crustacean most prevalent in the frigid pristine waters of the Antarctic Ocean. Indeed, krill is so plentiful that it represents the greatest biomass on the planet. And it’s among the purest nutrient sources in the world. Krill feed on phytoplankton, which puts them so low in the food chain that they remain virtually toxin-free. Short of eating plankton yourself, you couldn’t do better! You see, krill delivers DHA in phospholipid form, rather than the triglyceride form you get in fish oil. And it’s what you absorb that counts, not how much you take. In contrast, fish oil triglycerides are tough to break down. That’s why you get the stinky burps. Worse, much of fish oil omega-3s can simply pass through your system unabsorbed. That’s another reason why you can wait forever for fish oil to work — and it never does! Multiple studies demonstrate krill oil’s absorption advantage — up to 60% more omega-3 reaches your cells where you need it! DHA in krill oil is attached to an antioxidant called astaxanthin, one of the few nutrients that can cross the protective blood-brain barrier. You could grow old waiting for ordinary omega-3 supplements to start working. But not with Omega Rejuvenol— you’ll start feeling “younger” the very first month you take it. 1. Potency. Its high concentration of the “Super Omega” DHA blows fish oil products out of the water. 2. Bioavailability. Krill oil and calamarine oil deliver phospholipid Omega-3s that your cells just gobble up. 3. The “Missing” Nutrients. Fat-soluble vitamins like K2, tocotrienols, and retinoids have been stripped from the modern diet — just wait until you replenish them. 4. Premium Quality. Every ingredient meets my strict standards for quality and purity. I stake my reputation on it. 5. Doctor-Formulated For Results. 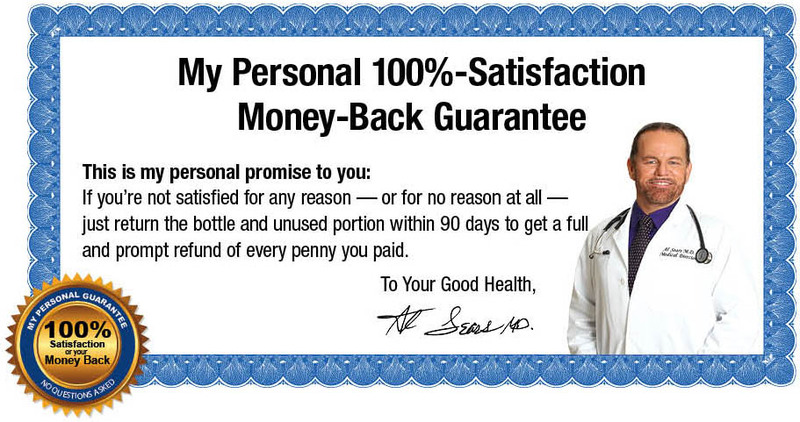 It’s based on my decades of practice in Anti-Aging Medicine to give you the “mind and body” support you really need. See for yourself. Read here for your risk-free supply today! And when astaxanthin gets through, it brings DHA along with it — with all its focus-sharpening, memory-saving, and mood-lifting powers. Fish oil, on the other hand, gets blocked at the gate. Not to sound like a broken record, but I can’t emphasize enough how important it is to get DHA into your brain. So how much DHA should you get daily? I recommend 500 mg of DHA for adults along with 60 mg of EPA, the other famous omega-3. 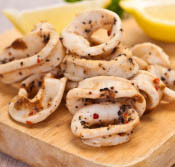 You may know calamari as a tasty seafood dish. I know it as nature’s second miracle DHA provider. By the time calamarine oil is distilled, its DHA concentration is a whopping 50%. Nothing else on the planet comes close! Calamarine oil is processed from Argentinian squid harvested in the pure waters of the South Pacific. This seafaring mollusk lives in the deep sea, far from the polluted surface waters. So, like krill, calamarine oil is a virtually toxin-free source for vital omega-3s. Most importantly, its super-concentration of DHA lets you easily reach my recommended level of 500 mg daily. It’s not easy finding nutritional formulas that provide optimal amounts of both krill and calamarine. And ALWAYS check the small print when you shop for DHA. Most supplements that advertise themselves as DHA formulas are processed from fish, including mercury risks like tuna, and not from ultra-pure krill and calamarine. Omega Rejuvenol delivers 505 mg DHA and 62 mg EPA in every softgel capsule. It meets my standards to a “T” because I’m the doctor who formulated it. And unlike formulas processed from risky fish like tuna, every milligram of DHA and EPA comes from the purest Antarctic krill and South Pacific calamarine. I consider it the ultimate omega-3 formula. It certainly outshines anything else I’ve seen. Needless to say, healthy cell membrane is critical for the very life of the cell itself. It protects against harmful invaders while enabling nutritional intake, cell signaling, and other life-essential functions. And as it turns out, DHA-rich phospholipids are the core building blocks of cell membrane. Not triglycerides you get from fish oil. In fact, phospholipids fits into the cell membrane like a hand fitting into a glove. Your cells just soak them up and put them to use. Phospholipid DHA Sounds Better and Better, Doesn’t It? The DHA-rich phospholipids you get from krill and calamarine literally rebuild the cell wall in a never-ending process of renewal! That means your cells stay protected. They communicate at their best. They absorb nourishment efficiently. They get rid of waste effectively. And That Helps You Live It up at Any Age! I’m convinced that cell membrane integrity is a huge reason why DHA works so well to keep you young. It may be the biggest. So let the fish oil makers bang their drum for their EPA-loaded fish oil formulas. Now, I wish I could say the phospholipid DHA in Omega Rejuvenol filled the only gap holding you back from the stronger health you deserve. But there’s a second group of missing fat-soluble nutrients you’d better brush up on, too. Like DHA, they’re crucial for cell health, including cell membrane support, and deficiencies are linked with a wide host of age-related health issues. You’ll Unleash a Second Surge of Youth Inside Your Own Body! Our ancestors got plenty of these vitamins because they ate animal fats and organ meats like their lives depended on it. They were right, and they instinctively knew it. Even our great-grandparents got enough. They didn’t run away from animal fats in organs, fatty meats, and dairy — they absolutely devoured them! That’s not the case today. I see patients who haven’t had liver or even whole milk in decades. Their tanks are empty when it comes to these fat-soluble nutrients — and it shows in their low energy and depleted health. What Would You Call a 90% Deficiency Rate? I’d Call It an Absolute Priority! Low K2 is a big problem at any age… but especially if you’re over 50. You see, K2 is an unsung hero when it comes to lasting heart health. It really makes a difference. It’s a critical nutrient for keeping blood vessels healthy and flexible — which is right at the core of maintaining a healthy heart. 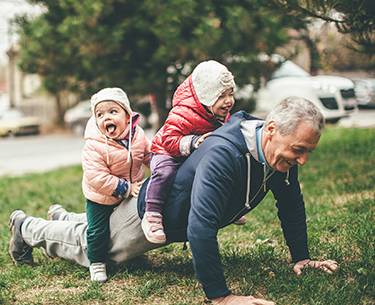 Scientists have recently uncovered a new key to cell health that helps pave your way to lasting youthfulness. They’ve unraveled the secrets of cell wall membrane — and the power of certain nutrients to generate new membrane and keep it healthy. At the top of this list are DHA-rich phospholipids — the very kind you get in Omega Rejuvenol. Hungry cells absorb these phospholipids right into the cell wall as if they were plugging a leak. This process maintains cell membrane integrity — and it turns every cell into a fortress that can protect itself… absorb nutrition… remove waste… and communicate with other cells with lightning-fast efficiency. Today, you can make sure your cells get the youth-extending support they need with Omega Rejuvenol. Its payload of phospholipid DHA and vitamins A, E and K2 promotes cell membrane generation. It helps turn a cellular “weak link” into a suit of armor that can help stop premature aging! Read here to see for yourself why it’s called Omega Rejuvenol. You’ll feel younger or you’ll pay nothing! Omega Rejuvenol gives you 50 mcg in every daily softgel. That puts you in the optimal zone in a hurry. That is, if you get enough. Omega Rejuvenol gives you the superior MK-7 form of vitamin K2. It’s the most bioactive form available. The same way DHA is the true omega-3 powerhouse, tocotrienols are the vitamin E workhorses. And they get shortchanged in supplements, too… just like DHA. Tocotrienols cost more, so vitamin makers use cheaper tocopherols. That works for them, but not for you! Tocotrienols are the heart-protecting vitamin E. They help keep C-reactive protein in check, which is a key goal in heart support. It was published in Stroke, the official journal of the American Stroke Association, so it raised quite a few eyebrows. Omega Rejuvenol gives you the very same vitamin E used in this Stroke study. It’s a state-of-the-art blend called Tocomin® —and I consider it the best vitamin E on the planet. Vitamin A is actually a group of nutrients that include plant-based carotenoids like beta-carotene on one side and animal-based retinoids like vitamin A palmitate on the other. Many people believe that beta-carotene is all they need. They’re wrong. Retinoids are critical, too. But they’re found in animal fats, so most people are getting less and less of them by the day. Before you know it, this shortfall can drain your energy and compromise your health. Your muscles, lungs, immune system, and kidneys all use retinoid vitamin A to keep running like clockwork. Beta-carotene alone won’t do. That’s why Omega Rejuvenol gives you the palmitate retinol form of vitamin A: you may need it! It’s the vitamin A many people are missing thanks to constant misinformation… in a safe, effective level for your everyday needs. Americans Are STILL Not Getting Enough! There’s overwhelming evidence that increased vitamin D levels supports virtually every area of health in your body. It’s the “everything vitamin” — being low is just not an option! Yet Americans still shy away from vitamin D-generating sunlight. So better safe than sorry: Omega Rejuvenol provides an extra boost of vitamin D3 to help fill the gap every day. In fact, I already mentioned it: astaxanthin. It’s contained in krill oil, but I added more. 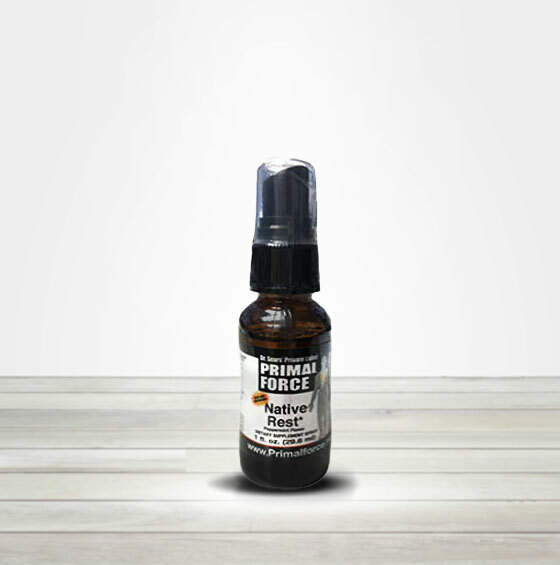 Its ability to cross the blood-brain barrier and protect your brain cells from damaging oxidation makes it one of the most powerful anti-aging weapons of all. We’re also learning that Astaxanthin is a potent vision protector. It’s able to cross the blood-retinal barrier too, something that even beta-carotene can’t do! That means it safeguards retinal cells from oxidative damage in ways other antioxidants simply can’t. All the more reason to add more of it to Omega Rejuvenol! And the “Thank Yous” I Get Confirm It! Freda G. from the Netherlands had achy legs for years. Nothing she tried worked — until she discovered Omega Rejuvenol. She’s thrilled by how quickly it helped! It’s Really That Good — and It’s Not Just Mark and Freda Cheering! So if you’ve had it up to here with foggy thinking… achy joints… fading vision… low energy… low spirits — all the signs of aging that frustrate you the most — Omega Rejuvenol will have you whistling a new tune in no time. And just as important, you’ll flood your cells with nature’s most powerful protective nutrients, in levels that could add decades of better health to your life. The Vitality You Thought Was Gone? Here It Is — Come and Get It! Whether you’re turning the page on smelly fish oil or trying omega-3s for the very first time, you deserve to experience what this true “next generation” formula can do. And rest assured, it’s the exact DHA-rich formula I recommend for my patients. Open the Floodgates to Better Health Without Risking a Cent! With Special Introductory Savings available with this offer, there has never been a better time for you to tap into the vitality and health that Omega Rejuvenol promises. SPECIAL e-REPORT #1 A $19.95 value! Here’s how to rebuild your strength and energy “core” at any age without putting yourself through grueling cardio, aerobics or weight training. This breakthrough program makes it easy to become naturally strong and resilient — just the way nature intended. SPECIAL e-REPORT #3 A $19.95 value! Each year, I travel more than 20,000 miles to study traditional diets and remedies — and I’ve seen these super foods in action. You’ll be amazed how they turbocharge your body and brain and make you feel young again. 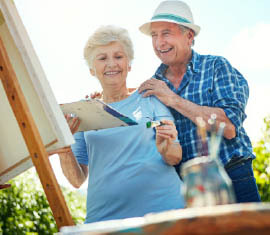 In this report, you’ll get dozens of additional strategies that can sharpen your thinking and prevent you from losing your memory and concentration as you age. You’ll learn the best ways to promote your mental clarity naturally and effectively. And you’ll have the confidence of putting the full power of the “Super Omega” and a full team of often-missing nutrients on the job to protect your heart… your brain… your eyes… and more. Order Your Supply of Omega Rejuvenol Now! With its power to strengthen… protect… and rejuvenate your health right down to the cellular level, Omega Rejuvenol helps you start a fresh new chapter in your life — a second Springtime! Click below to order your no-risk supply now, or call TOLL-FREE 1.866.895.8555 today. You’ve heard from folks who are thrilled with their results. You’ll be next — I guarantee it! P.S. Remember, you will receive up to three free Special Reports valued at a total of $59.85 with your Best Deal order of Omega Rejuvenol. With multi-bottle discounts and our 90-Day Money-Back Guarantee, now is the best time ever to try this state-of-the-art formula! 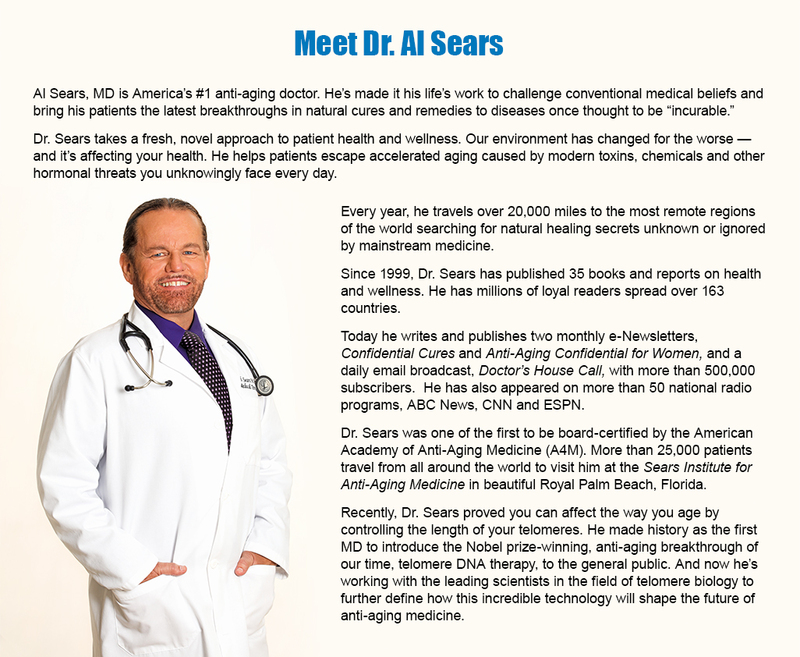 Dr. Sears’ Omega Rejuvenol Try It Risk-Free! BEST DEAL: Buy 2, Get 1 FREE! You get a 1-month supply for $49.95 plus $8.95 shipping and handling. Includes 1 bottle of Omega Rejuvenol and FREE subscription to Doctor’s House Call e-newsletter plus the FREE Fast Reply bonus e-Report, 45 Days to a Younger You, a $19.95 value. 1. Schaefer EJ., et al. “Plasma Phosphatidylcholine Docosahexaenoic Acid Content and Risk of Dementia and Alzheimer Disease.” Arch Neurol. 2006;63(11):1545-1550. 2. Dawczynski C., et al. “Docosahexaenoic acid in the treatment of rheumatoid arthritis: A double-blind, placebo-controlled, randomized cross-over study with microalgae vs. sunflower oil.” Clin Nutr. 2017 Mar 6. pii: S0261-5614(17)30087-0. 3. Johnson EJ., et al. “The influence of supplemental lutein and docosahexaenoic acid on serum, lipoproteins, and macular pigmentation.” Am J Clin Nutr. 2008 May;87(5):1521-9. 4. Asztalos IB., et al. “Effects of eicosapentaenoic acid and docosahexaenoic acid on cardiovascular disease risk factors: a randomized clinical trial.” Metabolism. 2016 Nov;65(11):1636-1645. 5. Arnoldussen IA and Kiliaan AJ. “Impact of DHA on Metabolic Diseases from Womb to Tomb.” Mar Drugs. 2014 Dec; 12(12): 6190–6212. 6. Mori TA., et al. “Docosahexaenoic acid but not eicosapentaenoic acid lowers ambulatory blood pressure and heart rate in humans.” Hypertension. 1999 Aug;34(2):253-60. 7. Koch C., et al. “Docosahexaenoic acid (DHA) supplementation in atopic eczema: a randomized, double-blind, controlled trial.” Br J Dermatol. 2008 Apr;158(4):786-92. 8. Dawczynski C., et al. “Docosahexaenoic acid in the treatment of rheumatoid arthritis: A double-blind, placebo-controlled, randomized cross-over study with microalgae vs. sunflower oil.” Clin Nutr. 2017 Mar 6. pii: S0261-5614(17)30087-0. 9. Schaefer EJ., et al. “Plasma Phosphatidylcholine Docosahexaenoic Acid Content and Risk of Dementia and Alzheimer Disease.” Arch Neurol. 2006;63(11):1545-1550. 10. Stough C., et al. “The effects of 90-day supplementation with the omega-3 essential fatty acid docosahexaenoic acid (DHA) on cognitive function and visual acuity in a healthy aging population.” Neurobiol Aging. 2012 Apr;33(4):824.e1-3. 11. Horrocks LA, Yeo YK. “Health benefits of docosahexaenoic acid (DHA).” Pharmacol Res. 1999 Sep;40(3):211-25. 12. Arnoldussen IA and Kiliaan AJ. “Impact of DHA on Metabolic Diseases from Womb to Tomb.” Mar Drugs. 2014 Dec; 12(12): 6190–6212. 13. Xiao Tang., et al. “Short term effects of different omega-3 fatty acid formulation on lipid metabolism in mice fed high or low fat diet.” Lipids Health Dis. 2012; 11: 70. 14. Mori TA., et al. “Docosahexaenoic acid but not eicosapentaenoic acid lowers ambulatory blood pressure and heart rate in humans.” Hypertension. 1999 Aug;34(2):253-60. 15. Orr SK., et al. “Unesterified docosahexaenoic acid is protective in neuroinflammation.” J Neurochem. 2013 Nov; 127(3): 378–393. 17. Maki KC., et al. “Krill oil supplementation increases plasma concentrations of eicosapentaenoic and docosahexaenoic acids in overweight and obese men and women.” Nutr Res 2009;29:609-615. 18. Soderberg M., et al. “Fatty acid composition of brain phospholipids in aging and in Alzheimer’s disease.” Lipids. 1991 Jun;26(6):421-5. 20. Gimenez MS., et al. “Nutritional Deficiencies and Phospholipid Metabolism.” Int J Mol Sci. 2011; 12(4): 2408–2433. 21. Maresz K., et al. New study shows evidence that MensaQ7 Positively Impacts Inflammation. 13th international Nutrition and Diagnostic Conference. INDC 2013. 22. Geleijnse JM., et al. “Dietary Intake of Menaquinone Is Associated with a Reduced Risk of Coronary Heart Disease: The Rotterdam Study.” J. Nutr. 2004 vol. 134 no. 11 3100-3105. 23. Geleijnse JM., et al. “Dietary Intake of Menaquinone Is Associated with a Reduced Risk of Coronary Heart Disease: The Rotterdam Study.” J. Nutr. 2004 vol. 134 no. 11 3100-3105. 24. Matsumoto K, Okano J, Nagahara T, Murawaki Y. “Apoptosis of liver cancer cells by vitamin K2 and enhancement by MEK inhibition.” Int J Oncol. 2006 Dec;29(6):1501-8. 25. Abdel-Rahman MS., et al. “Menaquinone-7 as a novel pharmacological therapy in the treatment of rheumatoid arthritis: A clinical study.” Eur J Pharmacol. 2015 Aug 15;761:273-8. 26. Nowak G., et al. “γ-Tocotrienol Protects Against Mitochondrial Dysfunction and Renal Cell Death.” J Pharmacol Exp Ther. 2011 Oct 31. 27. Das M., et al. “Caveolin and proteasome in tocotrienol mediated myocardial protection.” Cell Physiol Biochem.2008;22(1-4):287-94. 29. Luk SU., et. al. “Gamma-tocotrienol as an effective agent in targeting prostate cancer stem cell-like population.” Int J Cancer. May 2011;128(9):2182-91. 30. Shirode A., Sylvester P. “Mechanisms Mediating the Synergistic Anticancer Effects of Combined γ-Tocotrienol and Celecoxib Treatment.” J Bioanal Biomed. Jan 2011;3:1-7. 31. Gopalan Y., et al. “Clinical investigation of the protective effects of palm vitamin E tocotrienols on brain white matter.” Stroke. 2014 May;45(5):1422-8. 32. Hoyos B., et al. “Hiding in plain sight: Uncovering a new function of vitamin A in redox signaling.” Biochim Biophys Acta. 2011 Jun 25. 33. Lee J., et al. “Prevalence of vitamin D deficiency in patients with acute myocardial infarction.” Am J Cardiol. 2011 Jun 1;107(11):1636-8. 34. Bogoch E., et al. “Secondary Causes of Osteoporosis in Fracture Patients.” J Orthop Trauma. 2012 Feb 25. 35. 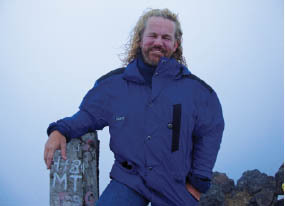 Nic Suibhne T., et al. “Vitamin D deficiency in Crohn’s disease: Prevalence, risk factors and supplement use in an outpatient setting.” J Crohns Colitis. 2012 Mar;6(2):182-8. 36. Jenab M., et al. “Association between pre-diagnostic circulating vitamin D concentration and risk of colorectal cancer in European populations…” BMJ. 2010 Jan 21;340:b5500.